The ergonomic design and wide variety of adjustment options on this office task chair make it a great choice for hectic afternoons at the office. Add in the sleek looks and stylish design, and this modern office chair will quickly become a favorite option. Overall Dimensions: 24 2/5"L x 27"W x 37" - 41"H.
Modern, high-performance design features a fabric-molded foam seat for extra support. Tilt tension and lock let you adjust these WorkPro 769T adjustable office chairs for a comfortable working position. Adjustable arms ensure a perfect fit. Can be adjusted to suit the height of your desk. Black desk chair offers a classic appearance. WorkPro 769T black task chair blends stylishly with your existing décor. The Allure FlexBody with a high back designer mesh is one of the leading alternatives to the more ex.. 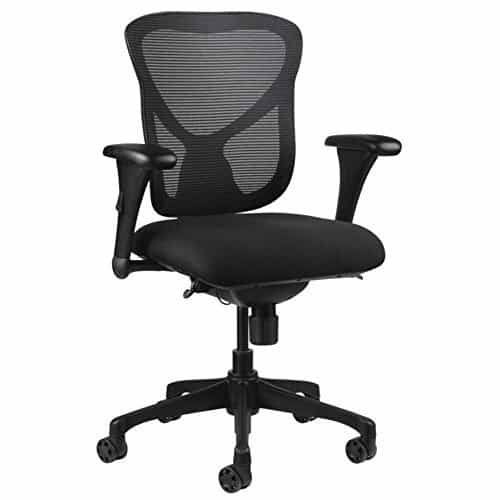 The Black Mesh High Back Office Chair with Headrestt and with a high back designer mesh is one of th..